Rachel Vincent writes paranormal urban fantasy for adults and young adults. Learn more at Rachel Vincent‘s website. Today, we are pleased to welcome fantasy author Rachel Vincent. Rachel is the author of two outstanding fantasy series: SHIFTERS and the YA series SOUL SCREAMERS. Shift, the latest novel in Rachel’s Shifter’s series, starring werecat Faythe Sanders, which went on sale this week. Please join us today in welcoming Rachel and be sure to comment on this post for a chance to win a copy of Shift, which she is graciously donating. Kaylee Cavanaugh wants to be a normal teenage girl, but her "panic attacks" stand in the way. Kaylee can sense when someone is about to die. She can't save the dying person, though, and can't warn them. All she can do is let out an unearthly scream. If you're familiar with mythology, you can probably guess what kind of supernatural being Kaylee turns out to be! As My Soul to Take begins, Kaylee learns that her premonitions are real and that her screaming episodes aren't symptoms of mental illness. Beautiful young girls are dropping dead for no apparent reason. Only Kaylee can see who the next victim will be. With the help of Nash, a gorgeous, popular boy who is also more than he seems, Kaylee sets out to learn who or what is killing these girls and stop the deaths. My Soul to Save begins at a pop concert. The opening act is Addison Page, an up-and-coming singer who dated Kaylee's reaper friend, Tod, back when he was alive in the normal sense. After her set, superstar Eden takes the stage. When Eden collapses mid-concert, Kaylee doesn't feel the urge to scream, so she's sure the pop star will be fine. But Eden dies, and when Kaylee sees the sludgy substance that wafts from the body, she learns that Eden didn't have a soul. 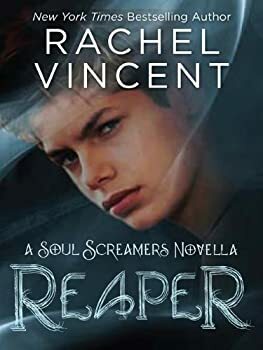 Rachel Vincent’s Reaper is a novella set in her SOUL SCREAMERS world. I read it because it was free for members at Audible during one of their promotions. 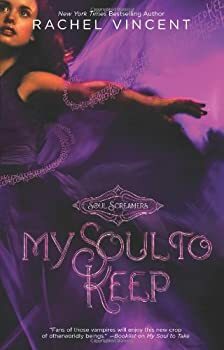 I haven’t read any of the SOUL SCREAMERS novels, but I’m familiar with the premise because I’ve read Kelly’s reviews of the series. Reaper is the story of how Tod, sacrificing himself for his impulsive younger brother Nash, became a reaper. We get to know Tod, Nash, and their mom pretty well. We also learn a bit about Sabine, Nash’s girlfriend, and Addison, Tod’s ex-girlfriend-turned-pop-star. My Soul to Keepdeals with the issue of drug abuse, but if you’re worried it will be a preachy Very Special Episode type of story, worry no more. 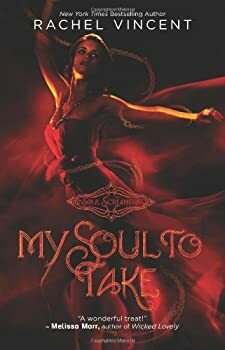 Rachel Vincent raises the book above that level — both by allowing the damage to strike very close to home for Kaylee and by placing the issue in an enthralling plot — so that it never feels like a simplistic “drugs are bad, mmmkay” fable. 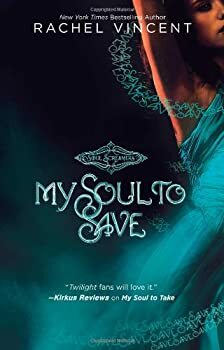 At the end of My Soul to Keep, the relationship between Kaylee and Nash was in limbo. 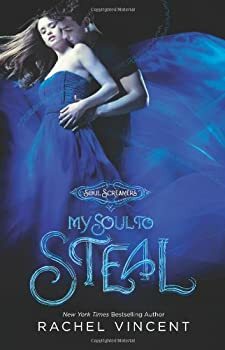 My Soul to Steal opens with Nash recovering but guilt-ridden, Kaylee not quite ready to forgive him, and Nash’s ex-girlfriend Sabine arriving on the scene. Nash and Sabine had an intense relationship two years ago but parted without closure after Tod’s death. Now, Sabine is determined to take advantage of the rift between Nash and Kaylee, and take Nash back for herself. Shifters — (2007-2010) Publisher: I look like an all-American grad student. But I am a werecat, a shape-shifter, and I live in two worlds. Despite reservations from my family and my Pride, I escaped the pressure to continue my species and carved out a normal life for myself. Until the night a Stray attacked. I’d been warned about Strays — werecats without a Pride, constantly on the lookout for someone like me: attractive, female and fertile. I fought him off, but then learned two of my fellow tabbies had disappeared. This brush with danger was all my Pride needed to summon me back… for my own protection. Yeah, right. But I’m no meek kitty. I’ll take on whatever — and whoever — I have to in order to find my friends. Watch out, Strays — ’cause I got claws, and I’m not afraid to use them…. CLICK HERE FOR MORE BOOKS BY RACHEL VINCENT.